This exhibition features photographs (Focused Views), prints (Chromatic Variants), and a sculpture (Lucid Stead Elements) by California-based light artist Phillip K. Smith, III. Shown here for the first time together, the works are inspired by Lucid Stead, Smith’s 2013 installation in Joshua Tree, CA where he transformed an existing homesteader shack into a mirrored structure that, by day, reflected the desert surroundings and, by night, shifted into a color changing projected light installation. Smith made Focused Views prior to closing the installation. They are detailed views of the homestead shack, drawing attention to the relationship between the weather-worn wood, reflection, and the environment. The day after he took the photographs, Smith returned the cabin to its original state with one exception: He did not reattach the original wood siding he had removed, but rather kept it catalogued in his studio. These wood slats become the basis of the Lucid Stead Elements sculpture series, one of which is on view. The sculptures are “cropped” views of the shack composed of the installation’s elements—the original wood siding, the mirror, the white light, the 2x4 structure, and the shifting color—contained within aluminum frames. 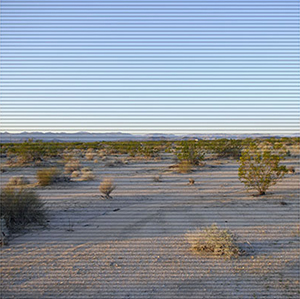 Chromatic Variants are a suite of prints depicting tight arrays of transparent colored lines that separate and merge an image of the desert with its color-tinted reflection. The colors echo the spectrum of light used in the windows and doorway of Lucid Stead, while white and black reference the changing light from day to night. Phillip K. Smith, III (b. CA, 1972) creates large-scale temporary installations drawing on concepts of space, form, light and shadow, environment, and change. His practice is informed by his architecture training at Rhode Island School of Design. His works include The Circle of Land and Sky (2017) at the inaugural Desert X in the Sonoran desert, Open Sky (2018), in Milan’s 16th-century Palazzo Isimbardi, and Detroit Skybridge (2018), commissioned as part of Detroit's Library Street Collective’s revitalization effort. Producing extraordinary and communal encounters via installations that explore the transitory nature of light, Smith fosters inexpressibly human, immaterial, and unifying experiences that elude language and defy form, but can be undeniably felt. Through his pacing of color, reflection, and use of the environment as material, Smith encourages us to slow down and observe our surroundings in new ways.